Across a swath of South Sudan, fields where green shoots should be poking through the wet soil lie untilled and overgrown; herds of cattle that would sustain communities through the lean season have been lost or stolen; food stores have been looted or burned. The people of South Sudan, the world’s youngest and one of its poorest nations, are accustomed to hardship. But six months of war has uprooted so many of them and destroyed their meagre livelihoods that some four million require humanitarian assistance. Relief workers scrambling to avert a famine report daunting obstacles: from the failure of South Sudan’s feuding leaders to halt the conflict, to near-impossible logistics and limited international attention and resources. According to UN figures, about 1.5 million people have fled their homes since December, when fighting broke out between supporters of President Salva Kiir and those of his former deputy, Riek Machar. Thousands have died in the violence, including many civilians brutally targeted because of their ethnicity. The failure of international pressure to stop the fighting before the planting season has prompted increasingly loud warnings that starvation could lead to far more deaths unless beleaguered civilians receive urgent - and sustained - assistance. A survey carried out in May by government agencies and food security experts forecast that 3.9 million people, or one-third of South Sudan’s population, would face ‘crisis’ or ‘emergency’ levels of food insecurity by the end of August, up from 1.6 million a year earlier. ‘Crisis’ and ‘emergency’ represent levels three and four on the widely-used Integrated Food Security Phase Categorization (IPC) scale. Level five is “famine”, defined by the IPC as “the absolute inaccessibility of food to an entire population or sub-group of a population, potentially causing death in the short term.” For a famine to be declared, several conditions have to be met, notably a crude death rate of two per 10,000 people per day and a general acute malnutrition rate greater than 30 percent. In rural communities, families would normally store stocks of food to see them through to the next harvest. But the displaced generally left their supplies behind, and host communities have had to share with relatives and strangers. Families have lost their livestock to theft, either by rival communities or ill-fed fighters from either side. In addition, traders who would bring foodstuffs from neighbouring countries such as Uganda and Sudan and exchange it for local commodities have been absent for months because of the fighting. Salt, for example, is almost impossible to find in some areas, Lanzer said. UNICEF, the UN Children’s Agency, said in April that the number of children under five years of age suffering severe acute malnutrition across South Sudan had reached 223,000, or double the total before the crisis. It warned that 50,000 of them could die this year unless they received assistance, such as therapeutic feeding. Relief agencies identify the southern counties of Unity State and parts of neighbouring Jonglei among the most critically affected areas of the France-sized country. In Unity’s Panyijar county, thousands of families from the surrounding area have taken refuge on islands in vast marshlands west of the White Nile River. Relief officials say many are subsisting on water lilies and tree leaves – a traditional fall-back in lean times. World Food Program airdrops have brought some relief, but aid workers say malnutrition levels there are soaring. Medical charity Medair said almost half of the 4,500 children it had screened in Panyijar since April were malnourished. It found that families were increasingly concentrating their meagre rations on their strongest offspring. “They want all their children to survive but they are worried that they will lose them all,” Medair spokeswoman Wendy van Amerongen said. Hopes of trucking food and other emergency supplies to isolated areas before the rains made many roads impassable were dashed by continued insecurity. The government and opposition agreed in early May to observe a “month of tranquillity” in order to allow civilians to go back home and sow their land, and to let in more humanitarian aid. But fitful peace talks in Addis Ababa have made little progress, violence has continued, and there have been few reports of civilians returning home in significant numbers. “There’s a lot of tension. 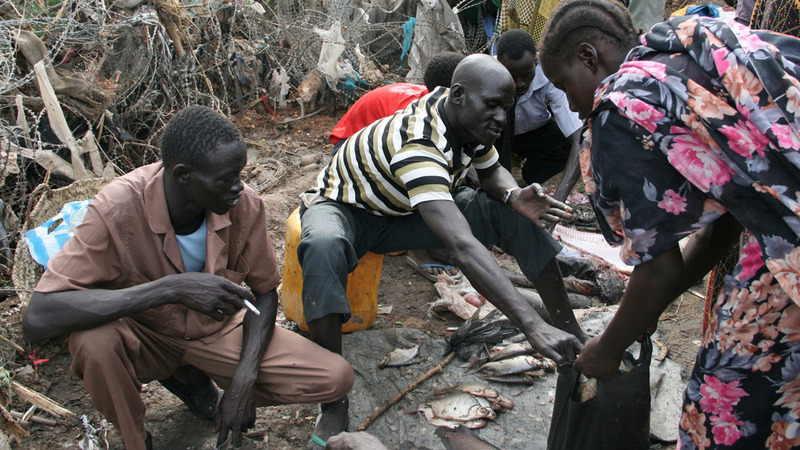 Places like Bentiu (the capital of Unity State) are really on a knife-edge. Anything can happen there, and it’s not the only location,” Mike Sackett, the acting country director for WFP in South Sudan, told IRIN. Where WFP did manage to pre-position food before the rains, much of it has been looted by armed factions or hungry civilians. In May, three warehouses in Upper Nile State were emptied after the areas where they were located changed hands during the fighting, Sackett said. With most main roads impassable, WFP has had to focus on airlifting and airdropping supplies, mostly using huge Russian-built Ilyushin cargo planes. To make sure the rations reached the most needy, and help prevent aid being seized by combatants, Sackett said WFP was inserting small “hit-and-run” teams into crisis zones for little more than a week to assess requirements, register those in need, and oversee the airdrops and the distribution. Other partners were vaccinating children and distributing seeds at the same time. 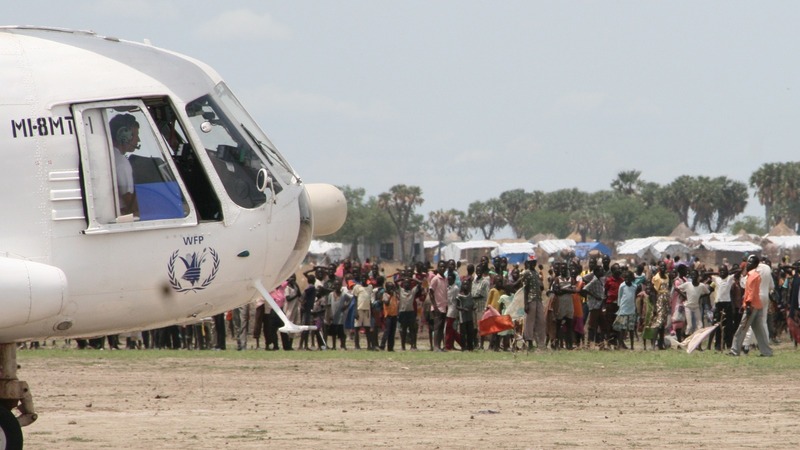 He said WFP enjoyed considerable goodwill from the two warring parties - a legacy of its massive aid operation in the 1990s during Sudan’s long civil war – and that this helped keep its aircraft and ground teams safe. However, Sackett said his agency simply doesn’t have enough food to meet the needs. Donors including the United States and United Kingdom pledged an extra US$600 million at a May conference in the Norwegian capital, Oslo. However, the UN says it is still US$800 million short of what is needed for this year alone. Sackett said it was still unclear how much of the new money would be allocated to WFP. “Even post-Oslo, we really haven’t seen any surge of new confirmed pledges that we can translate into physical food,” he said. The humanitarian effort has faced bureaucratic hurdles. Lanzer said UN officials spent weeks persuading the government to remove dozens of checkpoints along the few main roads still open. Unofficial taxes were adding 4,500 Sudanese pounds (US$1,200) to the cost of delivering a truckload of supplies. The UN also persuaded the government to streamline customs and immigration procedures for aid workers and relief goods. The environment brings other challenges. In Bentiu and Panyijar, planes have been unable to land after rain because the airstrip becomes too boggy. The UN is negotiating with oil companies to get access to an all-weather strip north of Bentiu. Still, UN agencies have reached over 80 locations in the past six months, mostly by air. The cost and limited capacity of even the largest aircraft means WFP is looking to send food barges up the White Nile, despite the hazards. In April, unidentified attackers fired guns and rocket-propelled grenades at barges carrying food and fuel to a UN base in Malakal, another tense northern town, injuring four crew members and UN peacekeepers. Lanzer said it was difficult to persuade barge operators to try again. But by early June, workers in Juba were loading food onto a convoy of barges that will have to cover the same route through both government and opposition controlled territory. WFP officials were already negotiating with local power-brokers to try to ensure their safe passage. “They are also passing through areas where people are probably pretty hungry … so there are three main threats,” Sackett said. For civilians, the rainy season brings some respite. With richer grazing, cattle produce more milk, while wild foods and fish can be more plentiful. Moreover, the first so-called ‘green’ harvest comes in September, ahead of the main crop in November. But yields are expected to be meagre in the north and east, where the fighting has primarily raged. Once those crops are used up, the food crisis is expected to intensify.